I've seen a lot of talk lately about product expiry dates and a shift towards decluttering & streamlining your makeup and beauty stash, or maybe that's just what I've been looking for in the blogging and YouTube community. It's got a lot to do with being away from all my products and belongings for the last five months because I realised I can live with so much less (since getting home at the end of October I immediately decluttered my whole wardrobe, shoes, makeup, skincare, perfume, books, etc). As a natural hoarder, I tend to build up collections of everything I become interested in, the only problem is things like makeup and skincare can expire. If you look on the back or the bottom of every item it should have a little symbol of an open container with a number in it which indicates how many months the product will remain "in date" once it's been opened. Now I don't take this number as gospel, particularly with makeup as it's just a guideline and lipstick is hardly as perishable as a carton of milk, I think what it comes down to is common sense - has the scent, colour or texture changed since you bought it, or has the product separated? Then it's time to go. Skincare, on the other hand, is a bit more tricky. This is because although you can still notice obvious physical changes to your skincare, what you can't see are the active ingredients losing their efficacy. Hoarding blush isn't nearly as much of a waste as having ten expensive serums open with the ingredients degrading before they can even be used. Not only is it a waste of money, but if your products last you a few years because you've been stretching them out, then it's also a waste of time because they won't be anywhere near as effective as if you were using fresh products within the intended amount of time. Don't dedicate yourself to finishing up products you don't really like - life is too short to use ineffective skincare and even though you don't want to feel like you've wasted your money, you're not doing your skin any favours by using up products that don't give it what it needs. pass them on to a friend or family member. Oh this is useful, thanks! I'm always a bit wary when I've had an open product for longer than recommended, because I don't trust myself to know enough to notice when it's changed (I guess it would be obvious?). You make a good point with the last one though, there's not point in trying to use something that's not suitable anymore, at that point you've spent the money anyway so no need to add skin problems to that! yeah, it's taken me a bit of time to figure these lessons out but i'm glad i finally have. i think it's more of an obvious one when makeup starts to discolour or say when lipglosses separate. it doesn't happen often and it certainly takes longer than what it says on the packaging to happen but when it does it's pretty obvious it needs to go in the bin. I couldn't agree with you more. If I'm going to spend my money I will use my products every day before they die! don't worry, it's only something i've realised recently but i do think it's important because if you've held onto something for a couple of years chances are it doesn't work as well as it once would have and it's a shame to let good products go to waste. I always know my skin would benefit from less products in rotation, but can't seem to practice what I preach! I'm definitely one to try and finish a product before getting something else and not be switching things back and forth too much. :) Great post! I am useless at finishing things - but I always forget when I opened them! It's so great to see another beauty post from you, Jess! Not that I didn't enjoy all your travel blog posts! Loving the new layout design too. :) When I go travelling, I always have the worst time deciding what products to bring with me and leave behind and it's funny when you realise how little you actually need. Of course, when I'm home, I love pampering myself with all my lovely products, but when it comes down to reality, your skin doesn't necessarily need it all. I know I could go without a lot of the products I own and my skin would be just fine, but there's that beauty obsessive in me that just can't help but want to try new things! I'm trying to live more within my means when it comes to makeup and skincare now and I don't have any skincare products currently on my wishlist, which is something new for me! If there's something I absolutely must try though, like you, I don't start using it until I've used up similar products. I'm currently using up my Hydraluron, so I can then start using my Caudalie Thirst Quenching Serum. I'm in two minds about not using up products I don't like anymore. I want to buy some new perfumes, but I already have too many! I'm trying to use a couple of them up, but it takes forever with perfume. I still like them enough, but I'm also kind of bored and ugh, I just can't decide whether to just give them away or aim to use them up! It's so satisfying when you finish a product though and it's not like I can necessarily afford to buy any new perfumes right now, anyway. Rent is evil! i've been bad in the past with trying products as soon as i've bought them but while i was away i realised i had so many open products and i worried about them expiring while i was gone and going to waste so when i got home i had a big cleanout and knew i needed to finish up some things i'd opened a while ago and put anything new away until i actually needed them. i have SO many perfumes but i'm trying to work through a few of them to use them up as well before i buy any more. they have a decent shelf life but they're also really expensive and it's silly for me to buy any more right now, i need to finish up at least two or three first! they just take so long! I don't think I've welcomed you back home yet so WELCOME BACK! I hope your 5 months away was as magical as it looked in photos. I find I am pretty good with skincare usually. I usually only have one of each purpose open at any one time and always either wait to finish one before I buy or open the next one, or I'll toss the old one if it's just not working effectively for me. All of your advice is great though; I do stockpile certain products (like Emma Hardie!) but I never open them until I'm ready because, like you said, the ingredients expire and degrade as well. Makeup on the other hand I'm not so good with. I just can't bring myself to throw out those MAC lipsticks that have been in my collection for 3 years! thanks precious! it was the BEST! you're much better with skincare than i've been in the past but i'm working on only using one or two of each type of product at a time because they're just going to go to waste if i have too many open at once and that's silly! i'm glad i've finally realised it. but of course i doubt i'm ever going to change my ways with lipsticks, haha. they're all slightly different shades after all! I bet there are a few products I need to get rid off. I am a hoarder, I just never know where to keep things. I'm at the stage where I'm experimenting with skincare (mainly cleansers and masks). 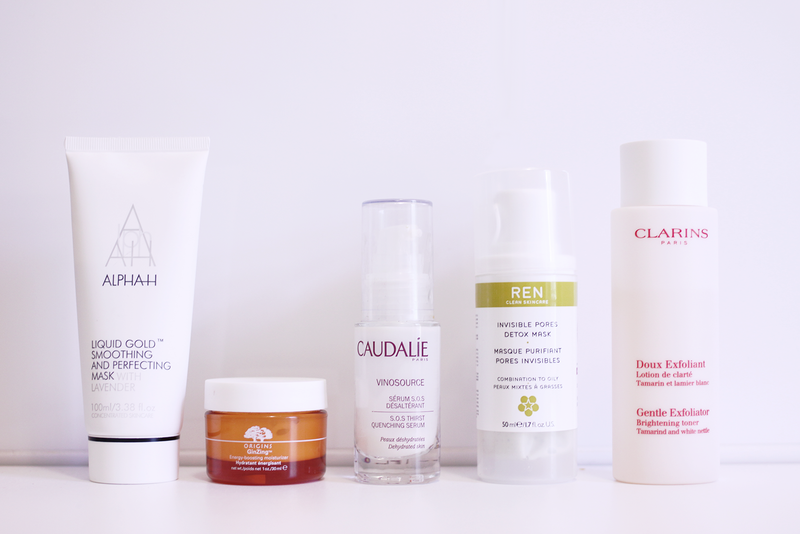 It's tricky to keep a one in one out policy like I do with the rest of my skincare. that's totally what happened to me which is how i ended up with a whole lot of products open all at once and i just realised that in order to get the most out of them and actually finish them up before they expire i've got to work through them one at a time and hopefully in future i'll have a couple on rotation at a time instead of 5 cleansers, etc. definitely! i've read people's blog posts where they say something isn't really working for them but they're insisting on finishing it up because they hate wasting money, but i just don't see the point. you're not going to get your money back no matter what you do, so why use something you don't like when you've got products sitting there that you love?